Three-time Masters champion Phil Mickelson says he suffered for not being "sharp" after missing the cut at Augusta for the first time in 16 years. The Open champion, 43, hit a one-over 73 to finish five over, one more than the cut mark, with three bunker shots on the 12th leading to a triple bogey. "That kind of stuff when you're playing tournament golf and you're mentally sharp you don't do," said Mickelson. "Physically I feel great, able to play healthy. But I'm not really sharp." 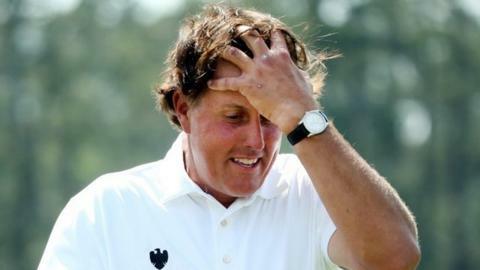 Ahead of the Masters, Mickelson - champion in 2004, 2006 and 2010 - had played 22 rounds of competitive golf in 2014, but withdrew from the Valero Texas Open in late March with a muscle injury. He tied 12th at the Houston Open one week ago but after finishing four over on day one at Augusta, disaster struck on the 155 yard 12th. "At 12 I hit the front bunker and there was no sand where I was at," said the world number five, who has only missed the cut at Augusta on one other occasion, in 1997. "I caught the liner of the bunker and bladed it across the green and the same thing happened on the other side. It went back and forth, three bunkers, before I finally got it to stay on the grass. "What I've been nervous about is having a hole like seven on Thursday, a hole like 12 today, where I go along making pars and putting the ball in the right spot and you just get a bad situation. "I didn't play great. I didn't play bad. I just had one bad hole there at 12. And I keep making these triples, they're tough to overcome." The 12th, a picturesque par three, claimed 34 shots from the field on Friday, with Mickelson's six the worst score of the day on what was the seventh toughest hole. After his exit, the tournament will play out a weekend without Mickelson and Tiger Woods for the first time since 1994, with 2012 champion Bubba Watson three shots clear of the field on seven under. Spain's Sergio Garcia, England's Luke Donald and former champions Charl Schwartzel and Ernie Els also finished on five over and exit the tournament at the midway point. The Augusta course again averaged more than 74 strokes for the field and only 14 of the players to make the cut start Saturday under par.